Alec helps his reward challenge team come from behind and win a picnic, letters from home, and the physical anguish of puking and pooping from the overeating. It's a great distraction for Nick, who sneaks off to find the Hidden Immunity Idol he found a clue to the night before. At the next Immunity Challenge, Probst gives everyone to the opportunity to overindulge on nachos and margaritas, but most forgo immunity. 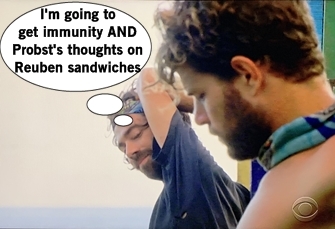 Carl is starving (and loves a good, cold beer) so he opts out of the challenge, as do Angelina and Nick. Alec is very aware that he's the biggest physical threat left in the game so he needs this immunity and is confident he'll win. 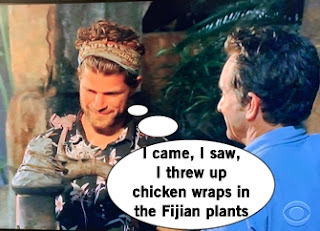 However, never underestimate Christian's willingness to hold on in an endurance challenge if it means he can converse with Jeff Probst about anything and everything in the universe. With Christian rocking the immunity necklace, Alec begins hustling to gain Christian's trust again and try to change his fate in the game because he's heartbroken to know he's likely ending up a unanimous vote-out. Alec's possible saving grace: Carl "The Godfather" who is calling all the shots, and also starting to irritate Gabby when he talks game plans in front of non-alliance members. Tribal Council time! Probst kicks off the night asking about the almost-six-hour Immunity Challenge and Christian said he plays his hardest because he only has this one time (dude, you'll be invited back for the rest of time). Alec really wanted it but couldn't last as his body basically gave out on him. 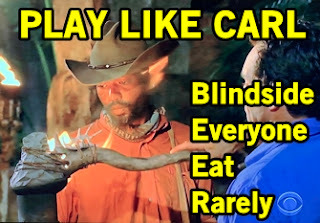 Alec brings up that it shows position in the game and character if you opt out of a challenge, and Carl reminds Alec that's he had literally no reward food and has been living on rice. Kara agrees with Alec that ultimately Carl felt safe enough to eat instead of guaranteeing safety, which gives Christian the chance to talk about calculated risks. Angelina agrees about the risks and uses this as leverage to talk about the Goliaths betraying her at the last vote. There's no risk-taking in this vote and the tribe unanimously votes Alec out. Who will become the next big target? The second hour is all about "The Godfather" himself: Carl. Our man Carl finally gets to go on a reward meal and along with fried chicken and cheesecake - and there's beer! Carl loves his beer and it makes him a little loose and he tells Kara the plan is to vote off Alison (her ally) next. Back at camp, Gabby is tired of being bossed around by "The Godfather" and him getting all the credit for the moves her and Christian are making. Not to mention, she knows she's being pushed out of the David alliance in favor of them replacing her with Angelina. Gabby begins her scheming to blindside Carl with the help of the three remaining Goliaths, while Carl tells Christian the plan to vote off Alison but purposely exclude Gabby from the plan. Let the David battle begin. But first, let's actually survive the game. 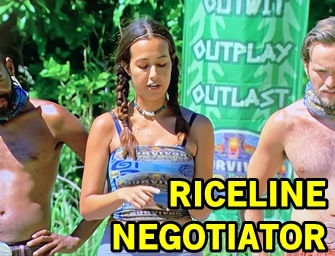 The tribe is pretty much out of rice and they're probably going to starve so Angelina takes on the role of negotiator to get some rations out of Probst. 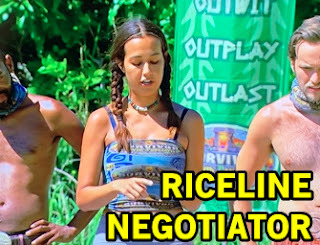 Ultimately, they give up a lot of gear and Angelina sits out of the Immunity Challenge for the sake of sustenance (and winning jury votes with her selflessness and willingness to make big moves). 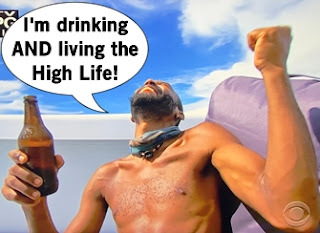 Davie wins Individual Immunity and it's quite the night of challenge beast-ness for the self-described "blerd". The tribe arrives back to camp with their new ration of rice, and Carl hopes to celebrate with extra servings when they vote off Alison. Dude, what about rationing to last until the end are you not getting? Ultimately the swing vote between Carl and Alison is Mike, torn between voting off the bossy one around camp or the big physical threat. Mike uses his skills as an actor to play it cool while listening to all the arguments to vote a certain way. Tribal Council time... again! Kara said last week's vote was essentially a sacrifice to try to work with the Davids and hopes this show of good faith by Kara and Alison will save them. Nick says camp is less chaotic now that the Davids are in control, and Angelina says camp is "jovial" but Tribal Council is the coliseum where they come to fight it out. There's also a lot of breakfast metaphors. Probst asks if the vote is as simple as picking off another Goliath and Mike says no, plus reward celebrations together help to build new bonds. Angelina brings up that the reason she made the negotiation move was because she's backed by strong allies that will stay by her side. Davie makes the best point that yes there are a couple plans for the night, but every person has their own plans to make it to the end. The move is made and David blood is drawn when Carl is eliminated from the game. I'd say pour one out for Carl but I don't think he'd want you to waste the beer.